Fall means that it's time to bundle up and be cozy! This post is extra special because I'm doing a giveaway collaboration with my lovely friend Adriana over at With Love, AR which is good news for you guys! Giveaway = FREE STUFF! Enter to win this scarf and beanie! We were talking one day and decided that we wanted to do a giveaway together to celebrate the coming of fall. Check us out as we talk about the giveaway on Youtube here. 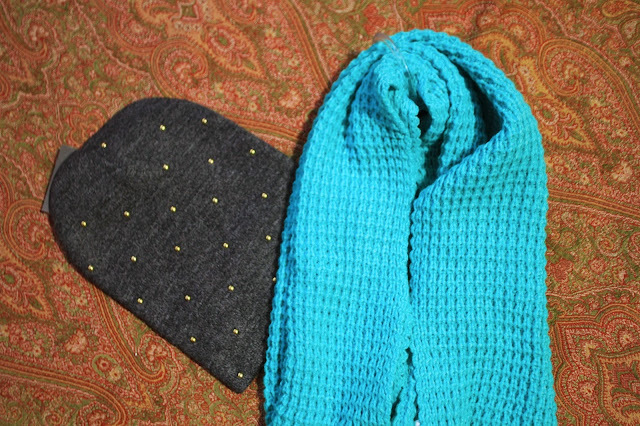 As a result, we're giving away a sea green colored scarf and a golden-studded gray beanie to one lucky winner! We love our readers so much that we bought these with our own money! Just enter through the giveaway below and you'll be entered to win! The giveaway will end on Monday, November 18th at midnight Pacific Standard Time. Unfortunately, this giveaway is only currently available to residents of the US and Canada. Maybe Perfect Isn't so Perfect? God is a Little Crazy... Isn't It Great? Copyright 2013-2014. Design by Nicole Rose Designs. Powered by Blogger. Header and navigation bar by NR Designs.